The opening ceremony of the exhibition “City Smart Development in Europe: Vienna” was officially held on 3 November at City Gallery. Organized by the European Union Academic Programme and co-organized with the Austrian Consulate General and City Gallery, the exhibition presents a vision of smart development, strategic planning and liveability of the city of Vienna. The opening also marks the launch of the 3rd edition of “Urban Innovations” – a series of events focused on exchange of expertise and dialogue between Hong Kong and European cities. Officiating guests included Mrs. Carrie Lam, Chief Secretary for Administration of the HKSAR Government; Mrs. Maria Vassilakou, Deputy Mayor and Vice-Governor of Vienna, Executive City Councillor for Urban Planning, Traffic & Transport, Climate Protection, Energy and Public Participation; and Prof. Rick Wong, Vice-President (Research and Development) of Hong Kong Baptist University. 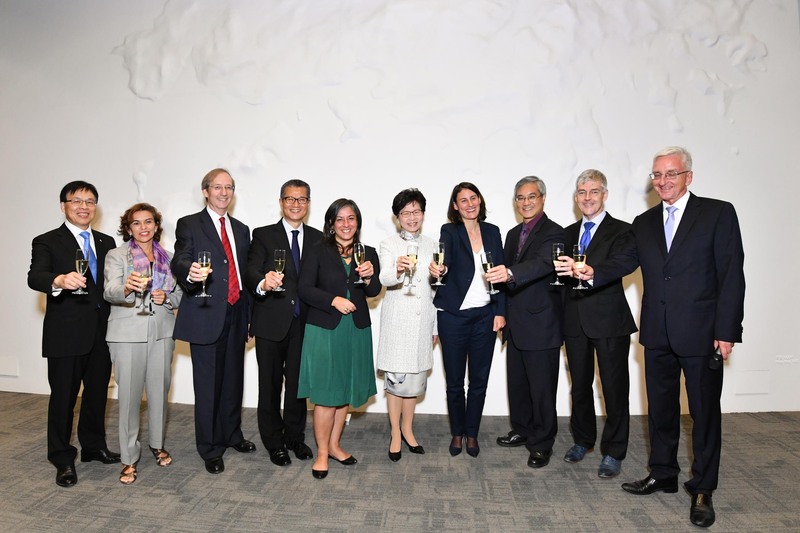 The guests of honour were Mr. Paul Chan Mo-po, Secretary for Development of the HKSAR Government; Dr. Claudia Reinprecht, Consul General of Austria to Hong Kong and Macao; Ms. Carmen Cano Head of EU Office to Hong Kong; Mr. K.K. Ling, Director of Planning, Planning Department of the HKSAR Government; Prof. Adrian J. Bailey, Dean, Faculty of Social Sciences; and Prof. Jean-Pierre Cabestan, Director-General of EUAP. The ceremony saw attendance of over 150 participants from the HKSAR Government, diplomatic bodies, business community, civil society and academia. In the opening remarks, Prof. Hans Werner Hess, Deputy Director of EUAP, said that “Urban Innovations aims to bring information about Europe to Hong Kong and also offer a platform for discussion among different urban communities”. He explained that this year’s focus on Vienna is dictated by the city’s outstanding performance in providing high quality of life based on long term sustainability oriented urban planning. Mrs. Maria Vassilakou mentioned that Vienna makes its key priority to develop innovative solutions, ensure social inclusion, and preserve natural resources. She stressed that what distinguishes Vienna’s approach from other cities is that, apart from focus on technology and environmental targets, its utmost goal is to engage all its inhabitants and guarantee that nobody’s needs are neglected. Prof. Rick Wong said that “Urban Innovations” series contributes to bringing in international experience and can help to initiate future improvements to the life of society in Hong Kong and Europe. He expressed hope for stronger international cooperation between the two, especially between young people and students who will soon shape development processes in their cities. The official opening was followed by the talk “Hong Kong – Vienna Dialogue: Public Space”, in which Mrs. Maria Vassilakou and Mr. Paul Chan Mo-po presented and discussed their respective perspectives on future development and qualities of public spaces in Vienna and Hong Kong. The speakers outlined ideas guiding the development and design of public spaces in Vienna and Hong Kong. Mrs. Maria Vassilakou said that the planning of public spaces in Vienna followed a simple principle: If it is good for children, it is good for everyone (e.g. safety, clean environment, free movement). She opined that public spaces, rather than buildings, constitute the heart of the city, even though the latter may possess great architectural qualities. The general walkability of the city should be a major indicator for successful urban development. Viennese planning therefore emphasizes issues of accessibility, usability, and socially inclusive design. Through concrete examples Mrs. Vassilakou could explain that Vienna pays considerable attention to ‘opening up’ its streets to citizens by permanent or temporary closures to car traffic and the organization of public events and private initiatives in such zones. The city also encourages co-creation and participatory planning. Mr. Chan drew attention to a shift in the HK Government’s approach: Citizens are now encouraged to take part in the planning of common urban spaces for a variety of leisure time purposes.